On a visit to France many years ago, Lord Montagu of Beaulieu was challenged by the Marquis de Goulaine, Grand Master of the Bretvins (the distinguished order of the Loire) on the absence of the United Kingdom as a member of the Fédération Internationale des Confréries Bachiques (FICB). 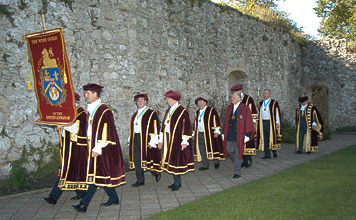 An application was sponsored by the Bretvins and subsequently approved by the FICB – “The Wine Guild of the United Kingdom” was thus formed. The Guild aims to share the enjoyment and appreciation of wine. It fulfils its objective through its social activities: dinners, tastings wine courses, and tours and other events for members. In its ceremony the Guild reflects the tradition of craft Guilds of mediaeval Europe but it is modern in the exercise of its aims. Its charitable trust provides wine education, bursaries and prizes to promote high standards and improved knowledge in the wine and wine service industries for the public benefit. The Guild is independent and not for profit, having no commercial interest in the wines shown at its functions.